This article guides you in how to print call logs from your iPhone. Visit our Droid Transfer page if you need to print call history from Android instead. Step 3: Choose the Call Logs tab. Step 5: Confirm your printer settings, and print! TouchCopy allows you to browse, copy and print call history from iPhone, iPad or iPod Touch. 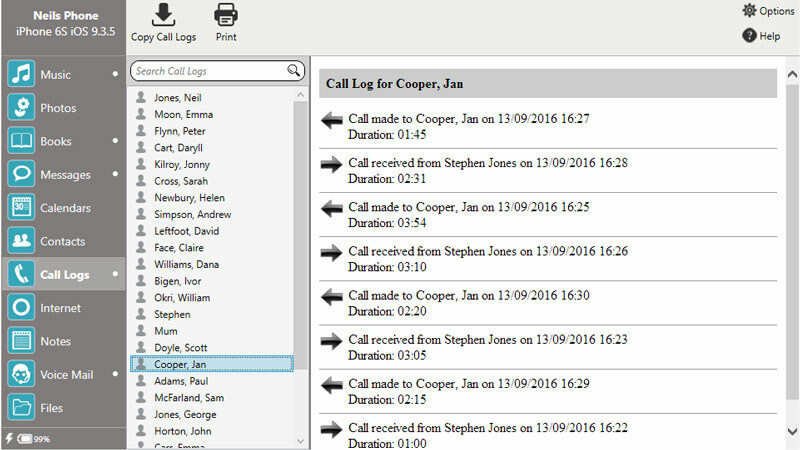 To have access to this feature, and to all the logs stored on your device, click the Call Logs button in TouchCopy. This functionality records telephone conversations and FaceTime conversation (iO6 upwards). TouchCopy displays a list of contacts or numbers who have called you or been called by you. Clicking on a name/number in the list displays the Call Log pertaining that person. TouchCopy will display information such as the date each call was made and the contact name or number, if this call was missed or unanswered, and how long the call lasted. Select which call logs you wish to extract by selecting one or more entries on the display list, then press "Copy Call Logs" in the Call Log browser. TouchCopy will then ask you where you want the data saved, and an HTML file containing the Call Log data will be created. If no entry is selected, the entire collection of Call Logs will be copied. Pressing the "Print" button will bring up your computer's standard print options. If a selection of call logs is made, those will be printed, if nothing is selected, the entire list of call logs will be printed.